Happy New Year, we’ve got some great food just for you this week! We’re making a change to our weekly lunch schedule this year, serving lunch Tuesday through Thursday each week. Check out our First Fridays Steak and Seafood night on February 4, and please have a look at what we’re offering for Valentine’s Day, February 14. We look forward to seeing you at the table this year! Here’s what’s cooking for you this week: crispy beef tacos, fried chicken and mashed potatoes, and shrimp étouffée. We’re Changing Our Lunch Schedule! We are truly thankful for all the folks who frequent our table and enrich our lives. Our catering schedule has greatly increased, so we’ll be serving lunch Tuesday through Thursday each week with our lunch specials and regular menu. We look forward to seeing you at the table this year! Thanks for giving into our lives with your time and talk, our lives are blessed because of you. Crispy beef tacos, black beans, and fresh salsas. We’ll prepare some savory ground beef for the crispy tacos, serve it with black beans, fresh salsas, and all the trimmings. Someone once famously said, “A well-balanced diet is a taco in each hand.” We couldn’t agree more. Come add some dietary balance to your life with these wonderfully fresh tacos. Fried chicken tenders, mashed potatoes, and savory-sweet green beans. Chicken tenders bedded overnight in buttermilk and hot sauce come fried in a special flour recipe and served with mashed potatoes, savory sweet green beans, and flaky honey buttermilk biscuits — good home-cooking at its best. Believe it or not, the Scottish first fried chicken in fat, though without seasonings. Those Scottish who emigrated to the United States, brought their fry-cooking with them. Add the battering and seasoning of enslaved West African folk in the South, who originally fried chicken in palm oil, and a need for food to stay fresh before refrigeration — and you have a southern table staple. Fried chicken, it’s a thoroughly multicultural affair. Who knew? If you can’t make it for lunch on Wednesday, just give us a call at 267-4457, we’ll set aside some supper for you of delicious fried chicken, mashed potatoes, and savory-sweet green beans. 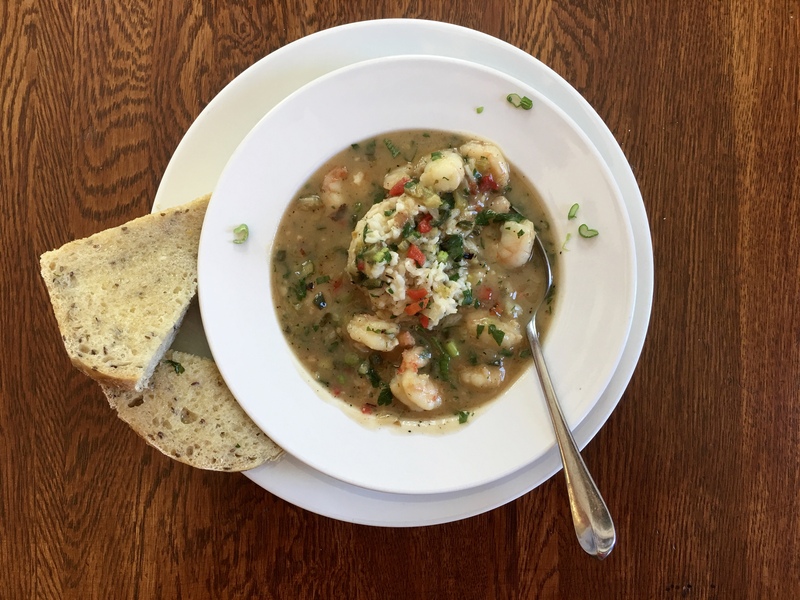 Shrimp étouffée, house salad, and fresh house-made bread ($15). Shrimp lovingly cooked with the tasty trinity veggies, a light roux, and delectable Cajun spices in a delicious sauce served over Louisiana rice will make you boogie up and down the street. Way back in 1983, the campy and boisterous “The A-Team” debuted with memorable characters such as “Hannibal” (George Peppard), “Faceman” (Dirk Benedict), “Mad-dog Murdock” (Dwight Schultz) and, of course, “B.A. Baracus,” played by the mohawked and bejeweled Mr. T. Sylvester Stallone saw Mr. T, and well, box office history was made in Rocky III. Some of B.A.’s most famous lines, “I’m gonna get you sucker” and “Pity the fool” still make the rounds. Hey friends, you asked for Friday nights, and we’ll start serving on the first Friday of the month with a specially prepared meal just for you. Friday, February 3, 2017, we’ll host a steak and seafood night with filet mignon or pan-sauteed snapper, scalloped potatoes, rice pilaf, roasted asparagus, creamy spinach, and house salad. The entrees will come with salad and a choice of two sides. Choices of appetizer and choices of dessert will be available for a separate price. We’ll have two seatings at 5:30pm and 7:30pm, and you may bring your own wine or beer. These nights are reservation only, so please make your reservations at (318) 467-2257 as soon as possible. Our next First Friday will be March 3. We want to help you have a wonderful and trouble-free Valentine’s Day meal. For $45.00, you can have a freshly made meal from our kitchen to your home that will be plenty of love-filled food for two people. See what’s cooking — to help you get cooking! We’ll prepare our creamy, dreamy and delicious spinach artichoke soup, house salad of mixed greens, tomatoes, and purple onion with a choice of house or ranch dressings, half a loaf of our freshly baked house-made bread generously spread with garlic butter, a generous portion of our chicken carbonara — bow tie pasta swims in a creamy white sauce with lots of good friends — oven-roasted chicken breast, mushrooms, garden fresh veggies, and green onions, and our famous white chocolate bread pudding with lots of rum sauce. What you’ll need to do: For $45.00, you can have a freshly made meal from our kitchen to your home. Please call us at (318) 267-4457 by Friday, February 10 at 6:00pm to order your meal. We’ll have everything prepped and ready for pickup after lunch service with instructions on how to get the meal ready on Tuesday, February 14. “When I get a little money I buy books; and if any is left I buy food and clothes,” noted 16th century Dutch philosopher Desiderius Erasmus. Well, we love books, too, but not at the expense of good food. Mr. Henry – I need to make a reservation for next Friday at 5:30 for 4. Is that available? Hey man, good morning! You got it. We’ll put you on the list. Thanks!